Skeptical Science (SS) is a disinformation site which more correctly should be labelled UNSkeptical UNScience. 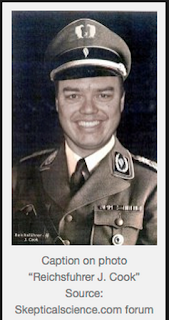 It is run by a cartoonist John Cook who likes to dress in SS costume. The image above was on that site but has since been removed. It has since been revealed the "Reichsführer J. Cook" has stolen the identity of Physicist Luboš Motl to post on both his own SS site and also on the UWA site. We analyze the evolution of the scientific consensus on anthropogenic global warming (AGW) in the peer-reviewed scientific literature, .......... Among abstracts expressing a position on AGW, 97.1% endorsed the consensus position that humans are causing global warming. inspection of a claim by Cook et al. (Environ Res Lett 8:024024, 2013 ) of 97.1 % consensus, heavily relied upon by Bedford and Cook, shows just 0.3 % endorsement of the standard definition of consensus: that most warming since 1950 is anthropogenic. Whooops! Slight error - 97.1% found to be 0.3%. number of climate myths along the way. This site was created by John Cook. I'm not a climatologist or a scientist but a self employed cartoonist and web programmer by trade. I did a Physics degree at the University of Queensland and while I achieved First Class Honours and could've continued onto a PhD, I instead quit academia and became a professional scrawler. Too much doodling in lectures, I think. Nevertheless, I've pursued a keen interest in science and if anything, found my curiosity about how the world works increased once I wasn't forced to study for impending exams. Skeptical Science (SS) have detailed 176 "myths" with an "explanation." We debunk all SS's myths. After the SS "myths" we will address some extra myths. Thanks to various contributors and especially Anthony Cox for the majority of the work. SS claim that it is not the sun is false. The Sun has a greater correlation than CO2. SS says GW has negative impacts. In fact the reverse is true. SS claims there is a 97% consensus but as has been shown above, this is from a flawed study by SS's Cook. according to both RSS and UHI data sets. but that is a theory ready for extinction. Antarctica IS gaining ice. Sure is. Land or sheet ice has to be distinguished from sea ice which no one disputes is increasing. A slew of papers and research confirm the sheet ice is increasing. and the media were predicting it. CO2 lags temperature but amplifies warming. Nope. The climate sensitivity of CO2 has been greatly exaggerated and cannot amplify warming. that Global Warming is definitely not the most serious issue facing the world today. "Hurricanes aren't linked to GW"
Hurricanes aren’t linked to global warming. This is as good a statement of alarmists believing something which their own ‘science’ disproves as you’ll get. See Nature; see the IPCC and see Richard Muller. The evidence is clear: if AGW is real, hurricane frequency and intensity will DECREASE. Al Gore got it wrong. This point more than any other shows that Skeptical Science (SS) is a bad joke site. The Gore law case shows 9 fundamental errors in Gore’s film. These ‘errors’ were about things which did not exist or were exaggerated. Lord Monckton takes it even further by noting 35 errors. But make no mistake the Gore trial established that Gore got it wrong. Glaciers are growing. Glaciers declined during the 20thC because it got warmer, naturally. That decline was strongest in the first part of the 20thC which contradicts AGW. The rate of decline is now slowing, because it is not getting warmer. It’s all here in this comprehensive peer reviewed paper. It’s cosmic rays. This is a smug objection. Svensmark’s great work about cosmic rays and their potential effect on clouds is a work in progress with new papers supporting it coming out all the time. Saying cosmic rays do not effect climate is like saying clouds do not effect climate (see items 67, 123). 1934 – hottest year on record; in the US. Actually 1936 in the US despite attempts by GISS to remove this fact from the record. Can you extrapolate from the US to the world? Here’s one reason, the number of temperature recording sites, why you can. The point is we know alarmists have manipulated temperature records and been prepared to lie as the email scandal shows so maybe it was a hotter world-wide than the alarmists are prepared to say. Extreme weather ISN'T caused by global warming. Again the alarmists will go against their own IPCC ‘science’ to suit the narrative. AR5 has explicitly disavowed the idea that extreme weather is caused by AGW. It’s the Urban Heat Island effect. AGW ‘science’ now asserts the artificial heating of urbanisation causes no exceptional heating. This is garbage and Kauffman’s 2007 paper is still the best rebuttal of this nonsense. Figure 6 tells it all. See item 142. Medieval Warm Period WAS warmer. It was certainly warm hence the name. Was it warmer than today? Depends on who you talk to and when. 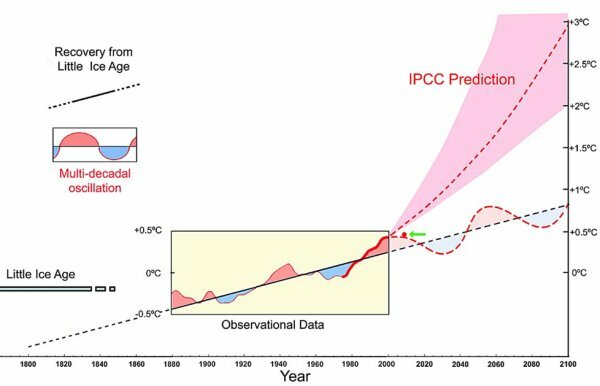 The IPCC thought so in 1990, see Figure 7.1. The IPCC also thought so in 2007, Figure 9.10. 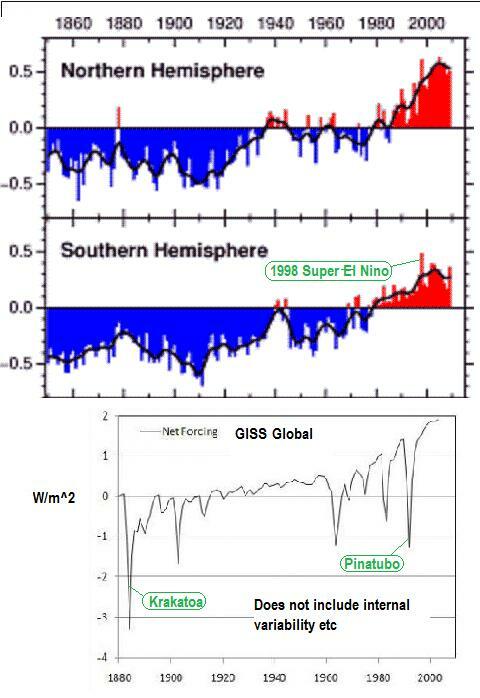 There are also plenty of peer reviewed papers which say not only was the MWP warmer than today but global; see here, here, here. The thing about the alarmists is the MWP, like all their evidence, is subject to suspect revision as the Huang et al controversy shows. Mars IS warming. Alarmist Andy Pitman says Mars warming is not relevant to Earth. But the Sun has increased its output during the period of Martian warming. So if the Sun was warming Mars during the 20thC surely it was warming Earth as well? Maybe it was Mars CO2? Mars atmosphere is 95% CO2, Earth has 0.04%. But Mars CO2 is not relevant to its warming because Mars atmosphere is too thin. Alarmist logic: more Sun warms Mars but not Earth; but more CO2 doesn’t warm Mars but less CO2 warms Earth. the alarmists predicted the Arctic would be free of Summer ice in by 2013. RF increases logarithmically with mixing ratio. But alarmists still maintain temperature could go up basically forever (items 7, 34, 91, 110); this is another prime example of alarmists ignoring their own ‘evidence’. Professor William Happer has a straightforward explanation of where the IPCC goes wrong in respect of the log effect. being added to in the oceans. In fact it’s leaving the planet. It’s a 1500 year cycle. There are plenty of cycles of lessor and greater length which plainly dominate climate. The longer one is the Milankovitch cycle. The shorter one is the PDO and AMO cycles. 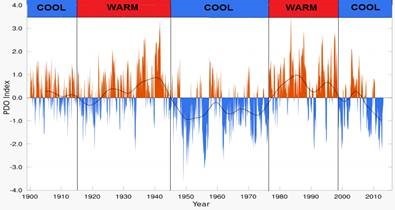 Arguably all the 20thC warming can be attributed to PDO phase changes because there were 2 +ve or warmer PDOs and only one –ve or cooler PDO and the +ve PDOs were asymmetrically warmer. AGW assumes a symmetry in nature which has not been true for geological periods. Human CO2 is a tiny percentage of CO2 emissions. SS wrong again. 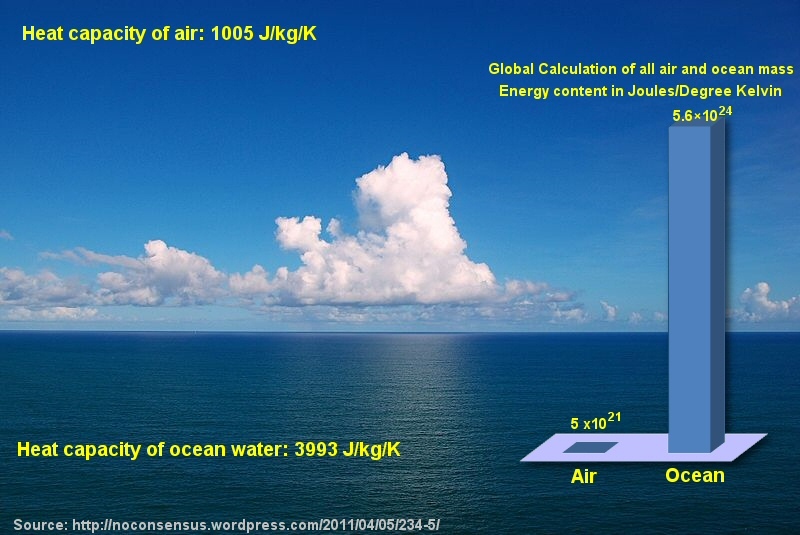 Water vapour IS the most powerful greenhouse gas. No question. 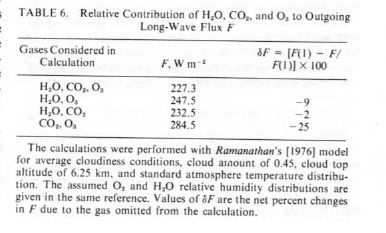 Ramanathan, one of the great climate scientists showed that Water Vapour has 2.5 times the radiative forcing of CO2. Ferguson and Veizer show CO2 is secondary to water vapour and the primary climate control ‘knob’ (see item 174), the Sun. 2 other interesting papers on condensation by Makareiva and Gibson show that water vapour processes dwarf any forcing by CO2. CO2 limits will harm the economy. Any cost on CO2, not carbon, is a straight tax on endeavour and profit. Every cost benefit analysis from Lomborg in Cool It, to Nordhaus, to Monckton all say that if AGW is real then adapting to it would be vastly cheaper than attempting to control temperature by reducing CO2 emissions in King Canute fashion by fiddling with a knob. But the real cost of controlling CO2 is not with the grants, the bureaucrats and the overpaid academics wailing about the end of the world. The real cost is renewables. Peter Lang and Martin Nicholson critiqued the alarmists’ plan to replace all other energy sources in Australia with renewables and concluded it could work if energy use declined by over 60% and Australia was prepared to cop the cost of over $4 trillion. World-wide this idiocy would cost about $76 trillion! After that there would be no economy left to harm. 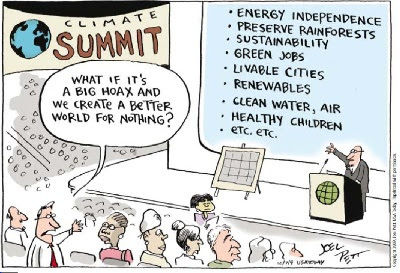 Maybe that is the alarmists plan. Greenland WAS green. Hence the name. Alarmists are surreal. Some facts. Greenland was warmer between 1920-1930 than today with many of the glaciers retreating to a greater extent in the past. Greenland was warmer 3-5000 years ago and the ice sheet smaller. The melting in Greenland today is possibly natural and due to geothermal heat, something which Cliff Ollier’s paper discusses. Only greenies could object to something being green. SS explanation is wrong, CO2 is NOT a pollutant. The EPA over nearly a decade sought legal vindication for its claim CO2 is a pollutant despite relying on discredited IPCC ‘science’. The final Supreme Court verdict in 2014 gave the EPA the right to regulate existing large scale emitters of CO2 but not the vast number of small ones. More importantly the Supreme Court specifically resisted the EPA’s intention to interpret statute according to its bureaucratic criteria. The Supreme Court strongly advocated the EPA was bound by Congress. 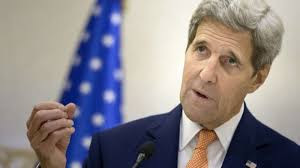 The upshot of this is if a Republican sceptic gets into the Whitehouse when Obama’s term ends with republican majorities in both houses this decision will change if new legislation that CO2 is not a pollutant is introduced. In short currently CO2 is a pollutant by virtue of the EPA’s ideological position and political fiat not the science. SS explanation is wrong, CO2 definitely is plant food. No doubt. Sage’s seminal study shows if CO2 had not increased from 200 to 270PPM about 12000-15000 years ago and enabled agriculture to develop than modern society would not have been established. It is beyond doubt that current levels of CO2 are good for food plants and plants in general. We know that greenhouse farmers inject CO2 into their plants to promote growth and this works up to levels above 1000PPM. We know the nitrogen and water issues have been resolved or proven to be overstated in typical alarmist exaggeration. CO2 has greened the world and contributed to crop production increase. Only alarmists would see this as bad. 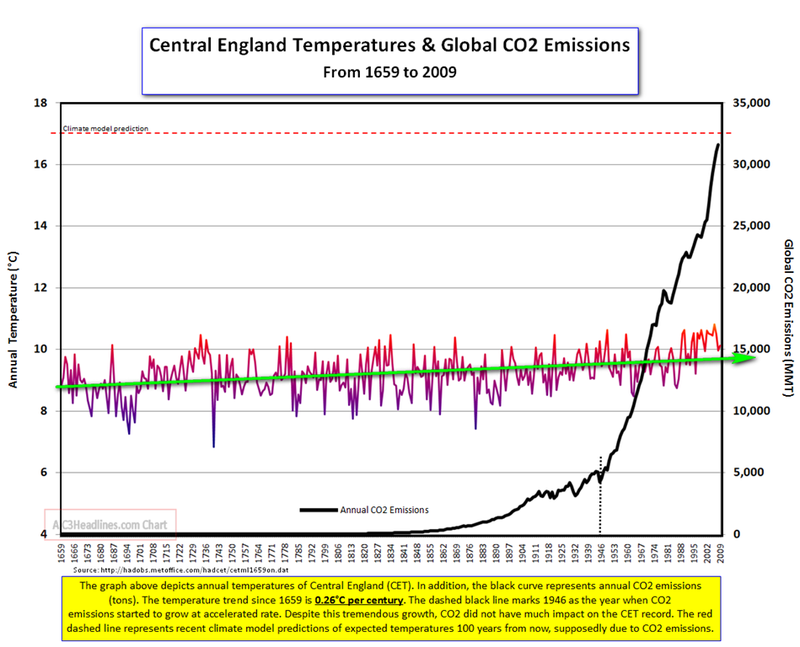 here’s no correlation between CO2 and temperature. As above. Plus an interesting post by David Stockwell following on from Beenstock’s 2 papers. Basically temperature and CO2 are different statistically which means there is limited correlation between them. 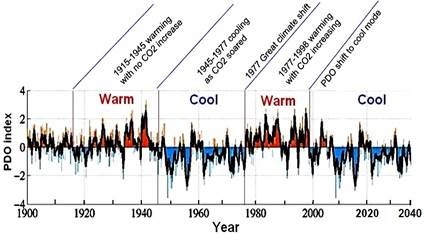 When you combine that with the log decline of the effect of CO2 on temperature (see no. 30 above) you can comfortably say at the very most the correlation between CO2 and temperature is effectively finished at concentrations well below the current level of CO2. See More HERE. SS explanation is wrong. Global warming has stopped. The time it stopped depends on which temperature indice is used. McKitrick’s paper says 19 years. Even the IPCC reluctantly says the warming has slowed down, effectively stopped, 0.05 (-0.05 to +0.15). This is indistinguishable from zero. As for 2010 being the hottest year ever recorded. This is clearly wrong and entirely dependent on choosing the hottest temperature measurement, GISS. See items 5, 38, 141. SS explanation is wrong. CO2 was higher in the past but the Sun was cooler. No doubt. This is known as the Snowball Earth/ faint-Sun paradox. The alarmists get into a tizzy about this because temperature was freezing with high CO2 levels so it must have been the faint Sun. This paradox occurred during the Archean, about 4000-2500 million years ago. The Sun at this time was about 75-82.5% of its current glorious self (for those interested in this sort of thing the formula for calculating this is 1/(1 - 0.38*t/4.55), where ‘t’ is the number of billions of years from now, negative for in the past. From James Kasting). The alarmists say not even huge CO2 levels, up to 550 times today’s value, could have compensated for the reduced Sun so this does not impact on AGW today where a piddling amount of CO2 can dominate the Sun which is much hotter than it was. But really CO2 was just as irrelevant back then as it is today. Theories abound to explain how Earth could be so cold with high CO2 levels and more importantly what mechanism, if not CO2, could get the Earth out from a snowball condition. The main reasons offered are clouds and albedo. And if you look at graphs comparing CO2 and temperature from 600 million years ago ( another snowball Earth scenario is suggested for 543 million years ago. See item 153) it is plain that faint Sun or not, and at this time, the Sun had grown to about 96% of its current level, CO2 and temperature have no correlation regardless of what the Sun is doing. SS explanation is wrong.It's aerosols. The science of aerosols is very uncertain (Steven Sherwood’s paper no less) and for that reason no certainty can be attached to AGW. Despite this alarmists, including Sherwood claim aerosols have caused the cooling from 1940-1976 and have masked the recent AGW warming by a process called dimming. Firstly the 1940 cool period was a product of a –ve PDO (see item 48). It can’t have been aerosols because since aerosols are human produced the cooling would have been greater in the Northern Hemisphere where most people and human production of aerosols occurs. In fact the Southern hemisphere cooled more. This is consistent with a –ve PDO which is ocean based and there is more water in the Southern hemisphere. Secondly, aerosols warm, even Hansen found this. But this warming effect of aerosols depends on where the aerosols are located with aerosols capable of cooling the surface and warming the atmosphere. It is clear that the effect of aerosols is not clear; any conclusions that they have caused cooling or masked warming as the alarmists claim is wrong. SS explanation is wrong. 2009-2010 saw record winter cold spells. Weather is not climate claim the alarmists but just watch every hot spell, real or imagined will be evidence of AGW according to the alarmists. Hypocrisy aside, well no, there’s nothing else except hypocrisy. There is ample evidence that cold is far worse than heat for humans to adapt to, and this applies to all time scales. As well there is strong evidence that heat was more of a problem in the past. The perversity of alarmism is that if AGW were real it would be more beneficial to humans than a cooling world. (as per item 3). SS explanation is wrong, It’s natural; yep; see items 1 and 54. As for “fingerprints”, item 56. One of the really strange things about the primary alarmist “fingerprint”, the THS, apart from the fact that it is not happening, is that alarmists even dispute the THS is a “fingerprint”: see here and comments here. SS explanation is wrong. There’s no tropospheric hot spot. No, there’s not, see items 56, 57 and part 6 here. Like all alarmist evidence the THS is shrouded with junk science, particularly by Sherwood (see section 7 here for his first effort, and here for his second). But the evolution of the alarmist position on the THS is also amusing. The THS is an essential element of AGW theory; AGW says more CO2 in the atmosphere will cause more evaporation and since water is a powerful green-house gas the extra water will cause greater warming. This will be most pronounced in the Tropical atmosphere since the Tropics have the most water. In email 1939 Peter Thorne, a prominent AGW scientist says: Observations do not show rising temperatures throughout the tropical troposphere unless you accept one single study and approach and discount a wealth of others. 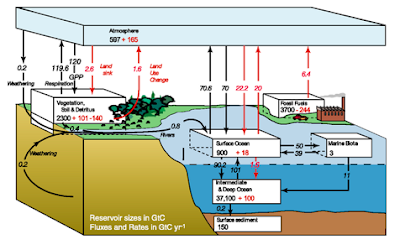 Despite Thorne's reservations the IPCC published a major diagram, Figure 9.1, in its 2007 AR4 report purporting to show a THS caused by greenhouse gases. As is plainly visible the pattern of a THS from greenhouse gases is very different from Tropical heating caused by other factors. There is no justification for this. Thorne has contributed to two other major studies on the THS done after AR4. In the first study in 2008 Thorne et al concluded that the model predictions and observations about a THS were in good agreement and that pre 1979 radiosonde temperature data, which is from weather balloons, had been responsible for any disagreement. 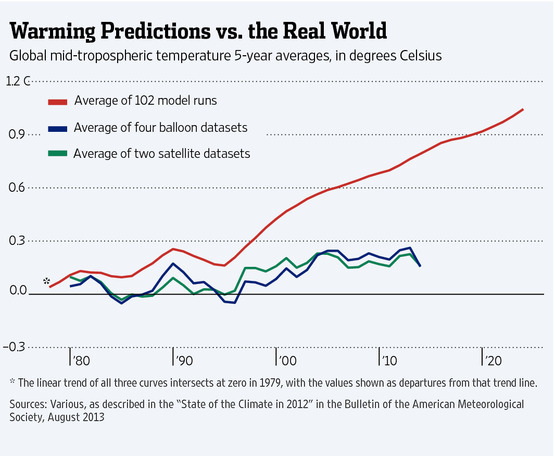 In his second 2011 study Thorne et al concluded that the observations since 1979 disagreed with the model predictions but when the observations from the radiosondes from 1958 were added the models and observations were in reasonable agreement. Everyone is allowed to change their minds. However, Thorne's latest paper disagrees, in varying ways, with studies by Paltridge 2009, Christy et al 2010, McKitrick et al 2010, McKitrick et al 2011, McKitrick et al 2011 and Fu et al 2011. So, there is no THS “unless you accept one single study” which is Thorne’s. SS explanation is wrong. Scientists can’t even predict weather. So how can they predict 100 years into the future. A valid point. Look at the Bureau of Meteorology (BOM). Their short term predictions and forecasts are abysmal and have been for a long time. They haven’t improved. They get basic things wrong such as saying the worst Queensland drought in 80 years when a rudimentary check of their own records would show the drought was the worst in 9 years. And at Alice Springs a crucial temperature site because it covers such a large area and can influence national trends, the BOM can’t even read its own thermometer. Anyway the CSIRO is just as bad as forecasting as the BOM. The problem with the BOM is that its short term forecasts are tainted by the alarmist long term predictions and AGW ‘science’. This means a failed theory is dictating short term forecasts. How serious this is was brought home by the Wivenhoe floods in 2011. The Wivenhoe dam was built as a flood mitigator after the worse 1974 floods but due to alarmist predictions of endless drought the dam was full as a drought mitigator. As a result it could not mitigate the floodwater. SS explanation is wrong. IPCC was wrong about the Himalayan glaciers. They were; see item 58. The science isn’t settled. Most of the science is junk, contradicted by the only criteria, empirical evidence. But what do you expect when the IPCC reports were audited in 2010 by the IAC and found to be completely deficient. The word is uncertainty and alarmism is full of it. No More grants then. Clouds do provide negative feedback. Absolutely; they did in the past and they still do. Here, here, here, here. 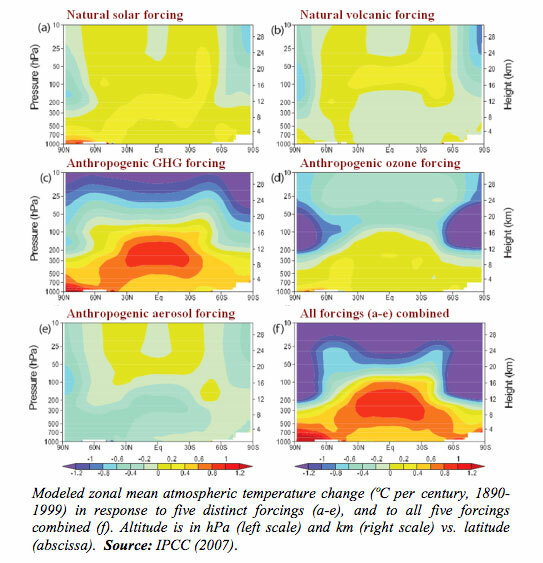 Spencer and Braswell present an interesting paper showing clouds moderate temperature trends; that is if it’s cooling, clouds warm and if warming then clouds cool. This moderating effect is also discussed in other papers. Generally the top of clouds reflect Short-wave radiation and by doing so cool, while the underneath trap Long-wave radiation and warm. The SW reflection cools more than the LW trapping heats. It’s the ocean. It’s a water world. All the energy is in the ocean (from here). Which is why the alarmists claim the missing heat is in the ocean. It’s not. IPCC were wrong about Amazon rainforests. Yep the IPCC effectively lied about the Amazon. The IPCC is based on grey, unqualified literature from green activist loons. The number of scandals like Amazongate is well over a 100. There are many false citations sourced from green groups. You can’t trust the IPCC. Corals are resilient to bleaching. Corals are resilient full stop, to bleaching and warming where there is evidence they thrive. Take the Great Barrier Reef (GBR). It’s been around for 18 million years. During that time sea levels were up to 120 meters lower than today and 10 meters higher. Temperatures have been 10ºC hotter and colder and CO2 levels higher. The reef survived. That hasn’t stopped alarmists like Hoegh-Gulberg making outrageous and failed predictions continuously. Despite the alarmism UNESCO did not put the GBR on the endangered list. In doing so the lies, hysteria and exaggeration of alarmism have been revealed again. Volcanoes emit more CO2 than humans. We don’t know; we haven’t discovered all the submarine volcanoes; about 80% of volcanoes on Earth are in the deep ocean. The main source of opposition to the idea that volcanoes are the main source of CO2 is Gerlach. Gerlach’s 1991 paper is here. A critique of Gerlach is here. A fuller exposition is here which details the gross underestimation of CO2 emissions from subaerial volcanoes while detailing the lack of knowledge about submarine volcanoes. Plimer’s books deal with this issue but the alarmists hate him because he has their measure. Newsflash: new study finds large increase in heating from ocean floor via submarine volcanoes. It is and this confirms Miskolczi who the alarmists love to hate (see section 4). See also Miskolczi’s 2014 paper. Basically Miskolczi theorises that as CO2 increases humidity drops and in that way the greenhouse effect as measured by the optical depth (OD) of the atmosphere does not change. The OD is the number of times infra-red radiation leaving the surface is absorbed and emitted by the atmosphere before it leaves the top of the atmosphere. Has humidity declined and the OD remained constant. Yes and yes. Alarmism really needs more humidity and the lengths alarmism will stoop to prove that humidity is increasing is shown by the Paltridge-Dessler debate. s per item 4. The consensus is a dreadful idea. John Cook has made it popular. Tol and Legates et al deal with the Cook paper and I have an interesting exchange with Mr Cook here. But when it comes to numbers the alarmists have not bettered the Oregon Petition. Springs aren’t advancing. Or season creep. Apparently they are creeping with some creepy papers alarming about it; fleeing species and dodgy data. However, its all part of the tropical expansion which is apparently due to PDO. Jupiter is warming. (see 81). Good, why should the alarmist elites living on Neptune get all the benefit from rising real estate prices caused by warming. Medieval Warm Period (MWP), about 1000 years ago, was at least as hot as today. 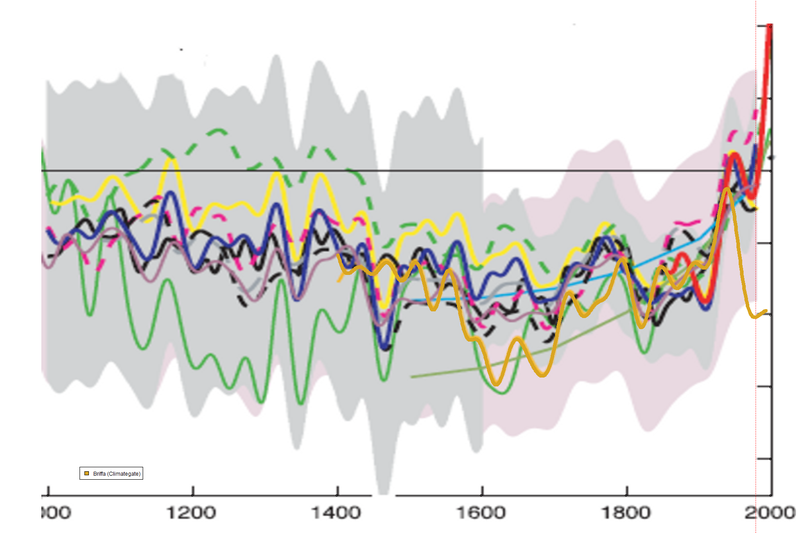 But the alarmists changed this to produce the Hockey Stick. Secondly, not content with changing the tree-ring proxy records of the past to produce cooling the alarmists have removed completely the tree-ring data from the present. Why? Because that tree-ring data contradicts the modern temperature record. 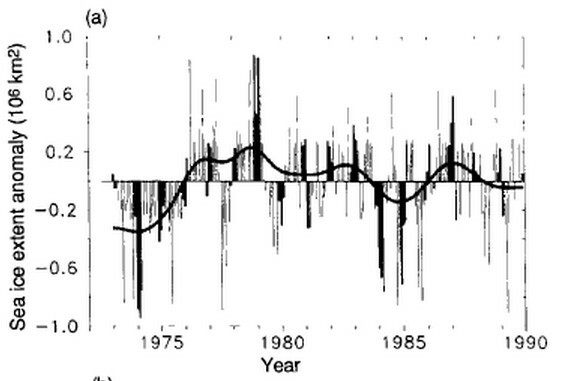 From 1960 onwards the tree-ring data shows cooling while the instrument record, the modern thermometers, show warming. Here’s the problem: if tree-ring data doesn’t match the modern instrument record how can we be sure the tree-ring temperature record used by the alarmists to prove the past was cooler is correct? We can’t. And that means the foundation of alarmism-that today is warmer than the past-has no scientific basis. Interesting - formatting is off and typeset goes off the chart to the right, making reading difficult. No. 45 is self-contradictory. CO2 and warming are not correlated, then CO2 and warming have only a weak correlation. My understanding is that temp drives CO2 increase, so the correlation is very strong in the longer record - tens of thousands of years, but the warmists have got the causality reversed. Warmth causes CO2, not the CO2 > warming. The fact of the matter is that the entire Green House Gas Scam is nothing less nor more than removing the compression from gas mechanics and replacing the 30+ degrees' warming with bullshoot tales about magic making the law of thermodynamics for solving temperature of gas, not work. Green House Gas Effect mathematics ALL REMOVE the COMPRESSION from ATMOSPHERIC energy MECHANICS.